Each rescue dog manages to touch my heart in a way... I didn’t know possible. However, few dogs have ever impacted my life... quite like my foster baby, Lucky. 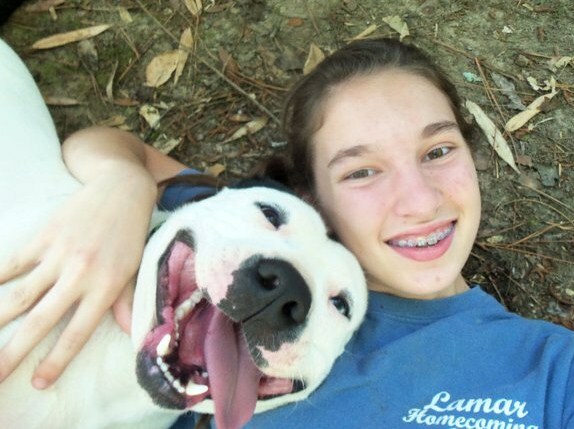 In January, my rescue friend, Lisa Hathcock, called me about a Pit Bull, who had been dumped at the Louisville, Mississippi shelter. This boy needed help... immediately... and Lisa knew I wouldn’t let him down. Earlier in his life, this Pit Bull’s owners had made the cruel decision... to crop his ears... with an old pair of scissors. As heartbreaking as that may sound... sadly, it doesn’t make him unique. Many dogfighters, thugs, and just-pain cruel people give their dogs "homemade crop jobs," often using an old knife or a rusty pair of scissors to remove the dog's ears. Tail docking is usually done in the same manner. No anesthesia is used. No pain meds are given. No sutures for the blood loss. Basically... one person holds the dog down… while the other mutilates their body with household cutting utensils. It’s unbelievably cruel… but sadly, very common. Why do they do this? There are several ridiculous reasons, none of which is justified. 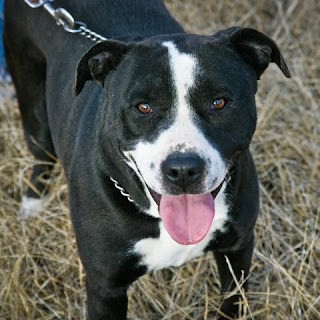 First, since cropped ears convey a more “vicious” appearance, the dog's ears are often removed, in an effort to intimidate others. Secondly, because the ears and tail can be a “hindrance” in dogfighting, they're usually removed, for sadistic purposes. Further, the tails of female breeder dogs are often docked... to make it easier to breed them. This particular dog was subjected to an especially painful crop job; as his ears were cut... right-down to his scalp, leaving no ear flaps whatsoever. Further, the dog suffered from a badly broken leg, which the owners never treated… leaving him with a front leg... he can no longer use. Then, he was dumped at the pound... and scheduled for immediate euthanasia. I wanted to meet him... before choosing his name. Then, when I pulled up, I saw the most precious, happy dog... rolling in the grass, with a big smile on his face. Obviously the pound was a step-up for him... and he felt lucky to be alive. The word “lucky” has always had a special meaning for me. 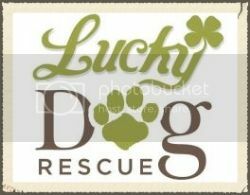 In fact, it’s so special to me, that I named my business “Lucky Dog Retreat,” and my rescue, “Lucky Dog Rescue.” My birthday is 7/11… two “lucky” numbers, and I’ve endured some things in my life... that have made me feel extremely lucky to be alive. So... I named him “Lucky,” deeming him the mascot for my life and my work. My nickname for him is “Lucky-Buppy” … don’t ask me why. Each dog gets a special nickname, and usually... it makes zero sense to anyone...other than me and the dog. 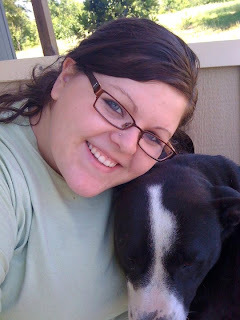 Lucky-Buppy has lived with me since that fateful day in January… the day he was meant to die. Despite the horrors of his past, Lucky is hands-down THE HAPPIEST DOG I’ve ever known. The joy he’s brought into my life is unreal. Lucky represents everything good in the world… wrapped- up in a badly-damaged package. His incredible spirit has truly changed my life. I’m so moved by his ability to forgive, and forget, and to love with a warmth that sets my soul on fire. I honestly can’t explain the beauty of my Lucky-Buppy in words… you’d have to meet him to understand. He’s amazing. Despite all of his special qualities, I knew the harsh reality for Lucky. I knew his chances of ever finding a family of his own... were so slim. 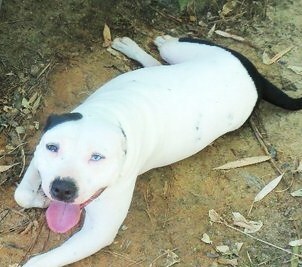 Lucky is a Pit Bull. Strike one. Lucky has no ears… giving him a very severe, intimidating appearance. Strike two. Lucky is a special needs dog, with a bum leg. Strike three. Lucky is not the kind of dog that people want to adopt. And even though I knew that Lucky would be happy living with me forever… all of the hope in my heart has been set on finding a special home for Lucky. I’ve also secretly wished that his new family would live in Meridian, so I could see him again someday. Now… let me backtrack a bit. A couple of months ago, Dustin’s 13-year-old step-sister, Libby, started visiting the rescue pups at Lucky Dog. 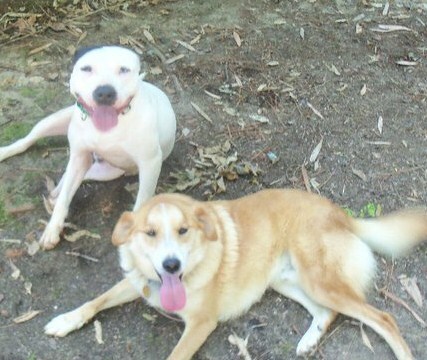 She immediately bonded with Lucky, for obvious reasons… he’s awesome. Lucky’s incredible love made Libby feel so special… as he’d follow her every move, and give her lots of kisses. I’d say, “Okay Libby. I promise I won’t drive to your house and check under your bed for Lucky. I’m sure he won’t be there…” And we’d both laugh. In that moment, Libby’s eyes lit up. I knew she wanted to foster Lucky... more than anything, but she’d have to ask her mom, Beth, first. Luckily, Beth had also fallen in love with Lucky over the months, so they decided to foster him over Memorial Day weekend. My heart was elated. When they got home with Lucky, Beth immediately called ... to tell me how much fun Lucky was having with their 2 other pups, Champ and Charlie. She said, “Ash! He’s having a blast! It’s like he’s always been here!” I was so happy… hoping maybe they’d decide to foster him long-term, until I could find Lucky's forever family. So then... yesterday... I was working at Lucky Dog, when Beth came through the door. I was surprised to see her, and I couldn’t wait to ask how Lucky was doing. I dropped whatever I was holding. I honestly couldn't believe it. And then, I was sobbing. I could barely muster the words, “Beth... thank you,” as I gave her a hug. That moment, was—without a doubt—one of the best moments of my life. It’s the best news I’ve ever received… and I didn’t even see it coming. I wanted Lucky to live in a home with a big yard and other dogs. I hoped they’d have children. I prayed they wouldn’t live far from me. I wished... upon all wishes... that they’d let me see him again someday. But after months of waiting... I realized that my dream... may never become a reality for Lucky-Buppy. Lucky will have a huge backyard... and other pups to play with. He'll live with his best friend, Libby. His new home is just down the street from my house, and I can see him whenever I want... which will be often. Lucky is now a Hill… just like me. *I love you Lucky-Buppy Hill! I’ll see you later this week, okay?! 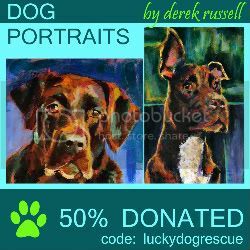 CLICK HERE TO READ MY ORIGINAL BLOG ABOUT LUCKY! Earlier today, I received a call about a puppy, who needed somewhere to go… immediately. 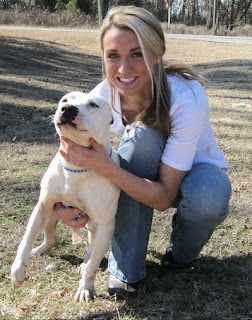 Greta is a 10-week old, Pit Bull puppy.... who is completely deaf. When her family became aware of her hearing impairment, they no longer wanted anything to do with her. Just like that. For a while now, I’ve had to tell people, “I’m sorry. I have no more space for rescue dogs" ... which is 100% factual information. Not only am I full, but I’ve already agreed to rescue several urgent dogs from another shelter... within the next week. So, I’m WAY full. My decision to take her ... wasn’t because I need another puppy. Trust me, I’ve got plenty… with more “puppy donations” being offered by the day. It wasn’t because I need another Pit Bull. 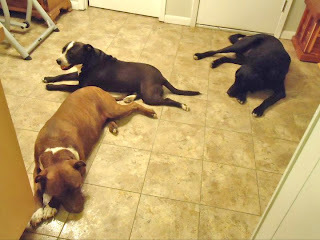 I think it’s safe to say... there’s no Pit Bull shortage at Lucky Dog Rescue. But in my heart, I knew what would happen to this sweet baby girl... if I didn’t take her. 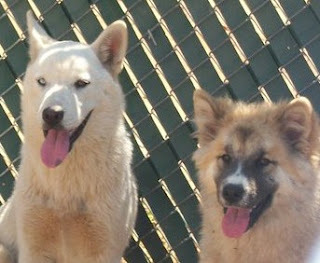 At the pound, Owner Surrenders are often euthanized immediately, especially when space is limited. Basically, the pound must hold stray dogs for 5 days, to give owners time to reclaim. More specifically, when it comes to Pit Bull Owner Surrenders at our pound… the dog will—without a doubt—be euthanized immediately. The same is true for special needs dogs. 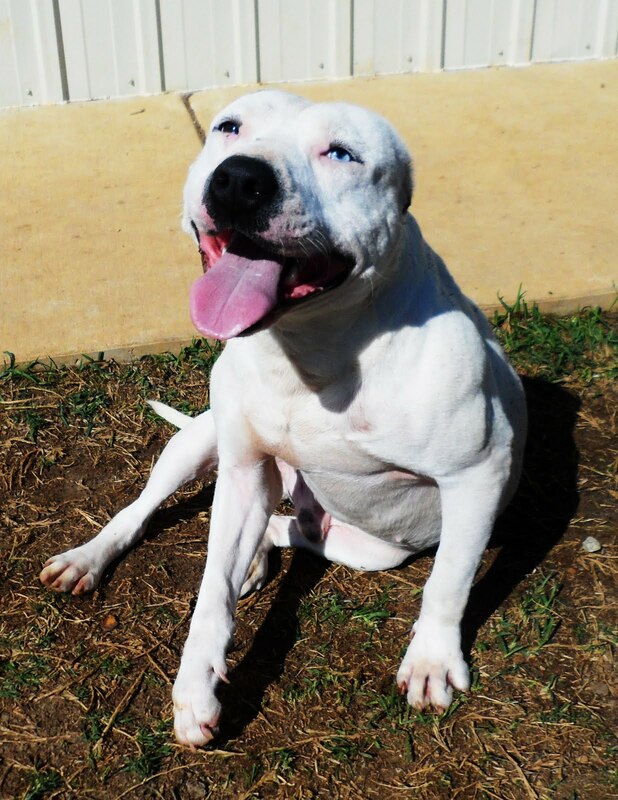 Greta is a deaf (aka-- "special needs") Pit Bull, who was also an Owner Surrender. She didn’t stand a chance. I thought about this special little girl... who clearly doesn't have the ability to hear... but does have every bit of her ability to love. And yet... her love was taken away, when her family realized that she was "different." Just like that... she was no longer special to them. She no longer mattered. She was no longer deserving of life. All they could see… was her disability. And to them, having a disability… made her worthless. So, I got off the phone, immediately got into my car, and drove to save Greta. When I arrived, I saw the most-perfect little dog on this earth... right there, waiting for me. Greta is perfection, in puppy form. Then, I scooped her up, and held perfection in my arms. I kissed perfection. I hugged perfection tight, and rocked her back and forth. I know she understood me, because she immediately kissed my nose, and snuggled close to my body. And just like that… Greta became special again. Last week, one of my favorite rescue friends, Adrian in Huntsville, Alabama, sent me a message about a shelter dog he’d just posted on Pet Pardons. He asked if I knew of any rescue groups that may be willing to take a 10-year-old Senior dog, who had just survived the recent, horrific tornado—on a chain. 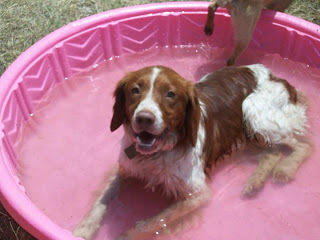 Obviously, he already had a rescue in mind: me... Lucky Dog Rescue. The shelter, Huntsville Animal Services, was severely overcrowded, due to the influx of dogs following the storms... and this special girl didn’t have much time. 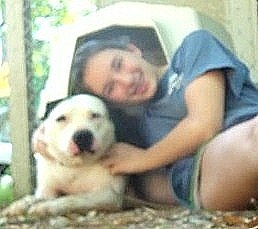 But the wonderful shelter director gave Adrian a time extension, to find rescue placement for the Senior dog. So, he posted the dog on Pet Pardons.... in hopes of finding someone who'd be willing to save her life. 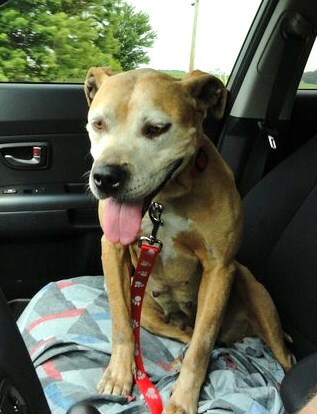 However, Adrian knew the reality for an older Pit Bull mix, who had lived her entire 10 years on a chain. She’s the kind of dog... no one wants. But... he also thought, after all she's been through... she deserves a chance, and he wanted to give that to her. Adrian sent me the link to the Pet Pardons profile he'd created for "Junebug" (the name she'd been given at the shelter). Junebug is a tornado survivor from the April 27th storms that came through Alabama. Her owners' house was completely destroyed—as it took a direct hit from the tornado. Junebug was chained in the backyard when the tornado swept through… and her life was somehow spared. However, her owners surrendered her anyway, because they said they were trying to get rid of her... even before the storm. Shelter staff has not seen any aggression from this girl… just a bunch of sadness. Reading those words... my heart shattered. "Junebug" had lived all 10 years of her life on a chain. She was rarely given any love or affection… but she loved her family anyway. Even more, this poor girl was forced to endure a horrendous storm—outside, on that chain—as the devastating tornado destroyed her house and yard. I picture her body flailing in the wind… I imagine the terror that filled her eyes… I can see her crying out for the family... who had left her there to die. I have no idea how she survived… considering that her family’s home was completely wiped away. Nothing was left… except for Junebug. But what’s even more heartbreaking… is that she DID survive… and her family still didn’t want her. The family said they'd wanted to “get rid of her,” even before the storm. In all honesty, they probably hoped that the storm... would just kill her for them. But Junebug survived. 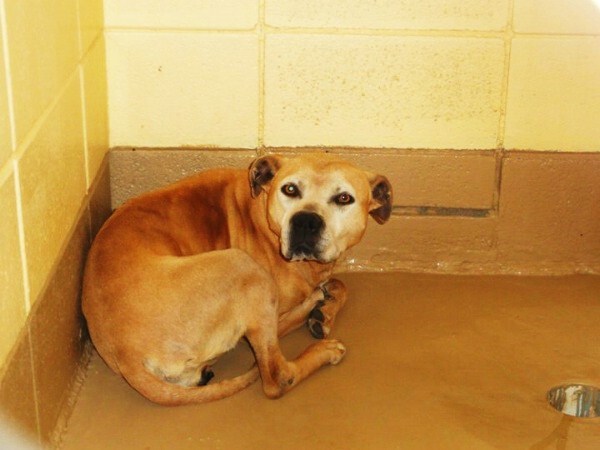 And then... after 10 years of love and devotion, the family she trusted with her life… left her in a shelter... to die. Her fate was almost certain… death in a shelter. Ask any shelter worker… 10-year-old Pit Bull mixes.... almost never leave the shelter alive. 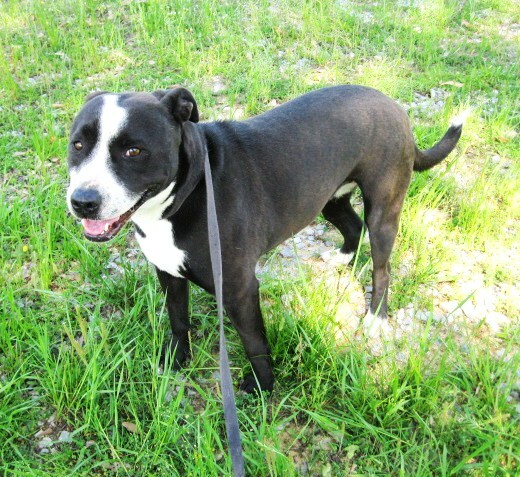 At the pound, Junebug was terrified and broken. After days of waiting for her family to return, she soon realized: they would never come back for her… she would never go home again. 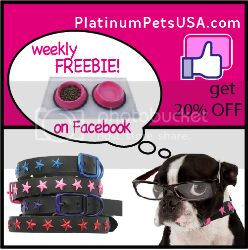 Each day, she’d cower in the corner of her kennel, as she waited… to die. But just before her time ran out, Adrian pulled Junebug from the pound and took her into his home ... until she could be transported to me. Her gratitude renewed Adrian’s spirit… as he told me, “Now I know, without a doubt, that they know when you save them.” He also renamed her “Melody,” after the song, “Unchained Melody.” We both thought it was fitting. 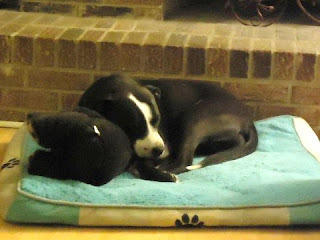 Then, this past Sunday, Melody traveled from Huntsville, AL to Meridian, MS... to live with me as one of my foster pups. When I met her, my heart instantly melted. Melody is beautiful. She’s incredible. And despite the horrors of her past… the sincerest hope and innocence shine through her eyes. It’s been several days now, and Melody hasn’t stopped smiling. Her favorite thing: running in the yard. For 10 years, she’s never been able to run free, but now, she can play whenever she wants. As she takes off through the grass, I watch the years of pent-up energy being released from her body… and I cry tears of joy, because I gave that to her. Do your heart a favor. Adopt a rescue dog. 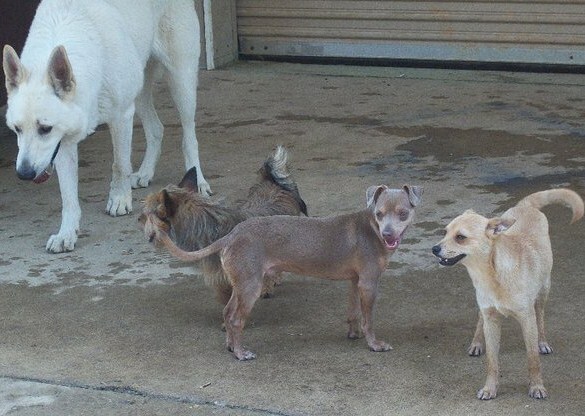 I’ve been so inspired by an incredible shelter in Andalusia, Alabama: the Andalusia Animal Shelter. This shelter has one very special mission: to make the facility—and the world—a better place for pets... and they work toward that goal every day. I have been employed with the City of Andalusia/Police Dept. for 7 years now. When I first started, I couldn’t believe the challenge I was taking-on. The shelter was dark, cold, and everybody (including myself) hated coming here. So of course, because I love bright and cheery colors, I first made the decision to liven it up—not just for the people, but it’s really helped the pets as well. In the beginning, the animals were not given a chance AT ALL. If they were still in the shelter after 7 days, they were automatically gassed. I could NOT believe that this was happening. So I started trying to make small changes that I knew would pay-off one day. I prayed often to God, to give me the strength to come back each day, because I knew He had to put me here for a reason. And soon, I found out what that reason was: to save these poor animals’ lives, promote adoptions, and create a more pleasant environment to encourage more people to come here. I fought long and hard to change the public's perception of the shelter, due to the fact it was given such a bad name over the years. I was able to accomplish that goal, and I was elated to find more support in the form of volunteers and help etc. So all in all, I have taken on the job of mentor, manager, friend to the animals, EBI tech, and on and on. I have many hats, and love every single one of them. You see, I have to make judgment calls that most would run from, but I make every decision out of my desire to be the best I can be in my field—and most importantly, to be able to look at myself in the mirror every day. While I feel I have accomplished these things, I still have a long way to go! Why I made the decision to end the gassing in my shelter: When I started here, euthanasia was performed strictly by gas chamber, and I hated it. I had nightmares about it, and literally cried every single time we had to do it. But at the time, that’s all we had. Then, I was offered a class to become a Euthanasia-by-Injection (EBI) tech, and I couldn't wait to end the gassing. I was sent off to the class, passed with a 98, and was thrilled to come back home to Andalusia from Huntsville with loads of information to share with my employees. I wanted to get us going in that direction right away. But it was no easy task. I had to endure a lot of scrutiny and negative comments, like, "Why waste all that money when what we’ve got is soooo much cheaper and it gets the job done?" That was unacceptable to me. EBI is far more humane for the animals than the gassing method, and as far as the cost aspect, isn't that much more expensive. It was a struggle, but we managed to make the transition with relative ease. I have to say it was one of the best decisions I have ever made!!! 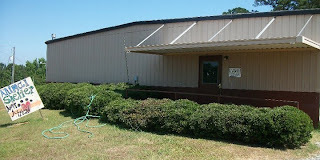 Getting critical vet care for our animals: We were once again blessed when Dr.Bush (Veterinarian) moved back from North Carolina to practice here in Andalusia, AL. He has become our knight in shining armor. Dr. Bush has helped the shelter offer new services to our adopters, such as significantly reduced rates for spay/neuter and mobile vet services. His office is a RV, so he can come to us at the shelter anytime and conduct rabies clinics. He's also able to do all of our spays and neuters right from his RV-turned-surgical-suite, along with a host of other things. Dr. Bush is so great! He does all of these things for the "greater good" of the animals… and that’s the only way we do business here! What drives me to make a difference for the animals each day: For me and the Andalusia Animal Shelter, it’s always about doing better… not merely striving… but grasping, climbing, and reaching to be the absolute best. I refuse to euthanize ANY PET that is adoptable or that can be placed with a rescue for more training or help! I hope to one day be able to offer more services to our community, like puppy training classes and adult dog obedience training… but I’ve not yet been able to find anyone to volunteer that is qualified. Trust me, I have grand plans for our shelter… it just takes working toward those goals one day at a time, with a solid vision of what you want to become. 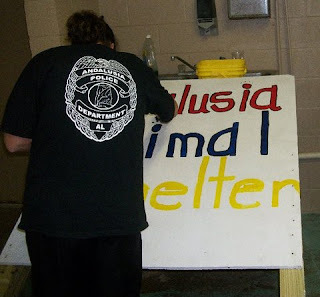 I am a firm believer that I was put here at Andalusia Animal Shelter because of my great love for all animals and willingness to make the shelter-world a better place for them. That passion is what drives me every day. 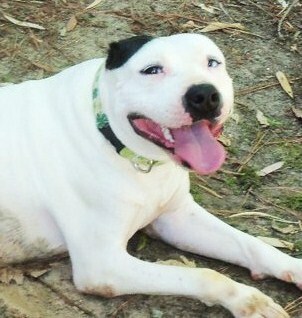 PLEASE LIKE THE ANDALUSIA ANIMAL SHELTER FACEBOOK PAGE!! !